Pause as typeface: Letters are consist of the essential graphic part makes letters legible and distinguishable with other letters, and subsidiary graphic part adds aesthetic purposes of letters. By splitting two different roles up in letters, we could get different two sets from the single set. Making a pause between them allows us to give some spaces when the time stands still. After the separation of parts, we modularize parts and then mix each other to create the one typeface. We call it this stage as a Pause. By interrupting perceptions which are created directly by readers when they see the visual material, Pause gives enough room and time to the text and reader to approach its meaning slowly. Pause deals with the issues which need enough time in social context. Pause as crafts: We do believe those crafts works create enough distance between readers and makers instead of interrupting to read. These differences challenge general ways of viewing and understanding visual materials and create room and time between readers and visual makers along with the typeface. 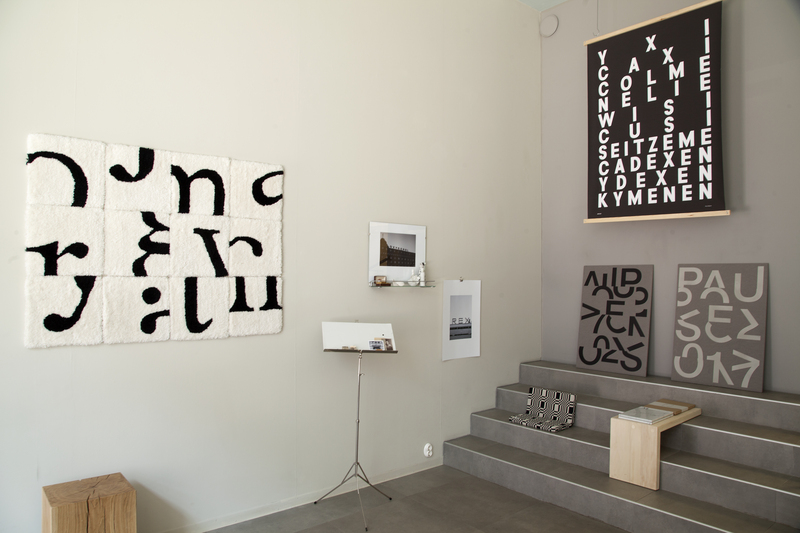 Pause is exhibited in the group exhibition TypoCraftHelsinki17 at gallery Lokal based in Helsinki, Finland and Kyoto Day at Sonen-an in Kyoto, Japan. Participation in the exhibition is granted by Aalto University and supported by Brainwood Oy.